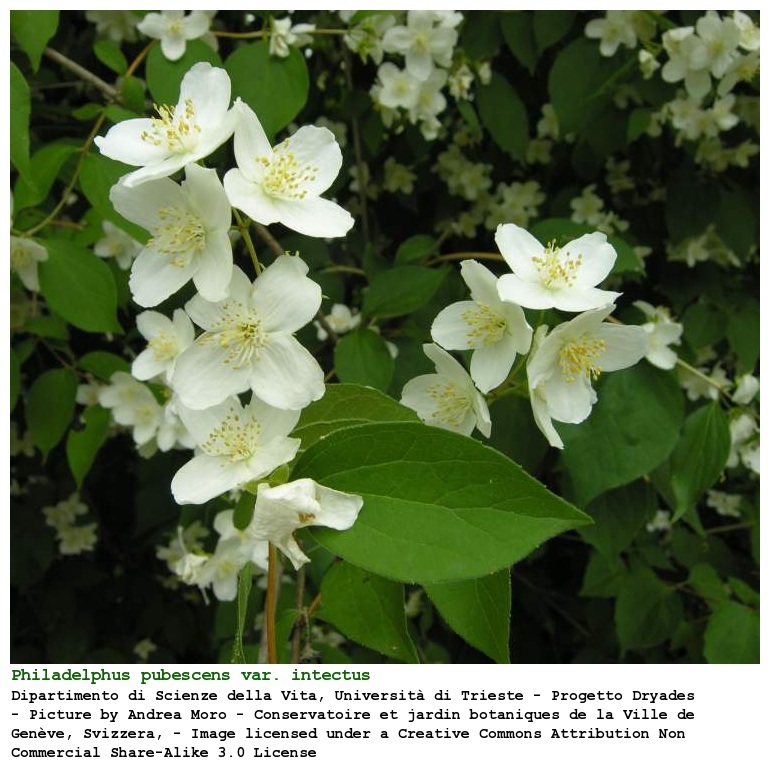 Philadelphus tomentosus.Andrea Moro.luirig.altervista.org (Accessed 9/2014). Philadelphus tomentosus is a shrub to 3 m tall, colonial from root sprouts, older bark grooved, shreddy, pale, brown, branching opposite, stems arching, rather weak, brittle, young twigs brown. Leaves opposite with underside densely soft-hairy, sometimes slightly hairy above; egg-shaped, 4-8 cm long, margin slightly toothed. Flowers fragrant, white, 3 cm diam. in 5-7 flowered unbranched clusters; regular, petals 4, stamens yellow, numerous, calyx lobes 4, from an enlarged base (hypanthium) in branched clusters of 5-7 in racemes (unbranched clusters), June-July. Fruit: Dry capsules, seeds numerous. Habitat: Possibly escaped from cultivation or, more likely, overgrown horticultural specimens (DeCandido 2001).